Over this past year, I have been doing some research into the history of knitting. And as far as that topic is concerned, frankly it has been surprisingly slim pickings. At the same time, it is intriguingly bizarre to see what sorts of titles come up when searching for information. For while there isn't much on knitting itself, there are plenty of books and articles on all sorts of knitting-related minutiae. My latest accidental find in that regard: The History of Knitting Pin Gauges, by Sheila Williams. I'll not include any spoilers here, you understand. But suffice to say, that much of what one might hope to learn about the origins of these devices, is covered in this useful volume. Of course what really got me, were the photos of the charming antique gauges. I was especially drawn to the ones shaped like bells. 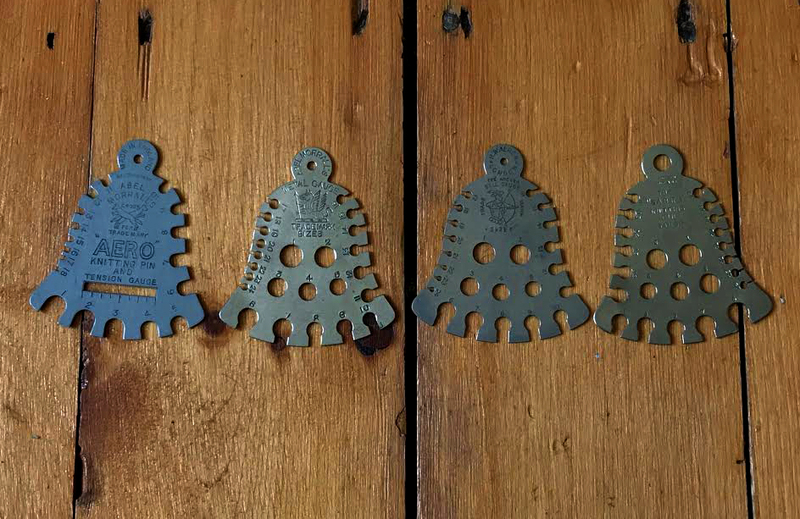 Certain that these were priceless, difficult to find collectors items, I had a quick look online anyway ...and was stunned to discover that for a couple of euros I could very realistically possess my very own vintage bell-shaped knitting gauge. Naturally, I now own a small collection! These gauges were all made in England, in the 1930s. All are the same in size and shape, but differ in their placements of the cutouts, in their metal finishes, and in their stamped, or engraved, illustrations. From left to right, mine are the Aero, the Griffin, the Archer, and the Sabre. There are many others to collect in the same vein, most made by the manufacturers Abel Morrals and H. Walker. So... if you enjoy using vintage objects and find yourself in need of a knitting gauge (or four), I think the antique ones are a good option. They are durable, accurate, charming, and inexpensive - and moreover, you will own (and possibly save from the trash bin) a small piece of knitting history. Where you can find them: the usual virtual auction website - just search for 'bell knitting gauge' or any of the names I listed above. The History of Knitting Pin Gauges, by Sheila Williams, is also easily available, new and used, via the usual online book sellers.